Partnering with the World Resources Institute, Blue Raster has developed an innovative tool to map the health of the southern forests of the United States. More than 200 million acres of forests, stretching from Texas to Virginia, are under threat from suburban sprawl, coal mining and resource extraction. Integrating YouTube, Flickr, WMS services, and KML, this Adobe Flex-based ArcGIS Server mapping application supports WRI’s initiatives of 1) increasing public awareness about these threats and providing useful information about the value of intact forest ecosystems, 2) identifying and developing options that direct economic incentive toward maintaining the health of these forests, and 3) tracking the execution of these initiatives and analyzing their progress. For more information regarding the World Resources Institute Southern Forests for the Future Project please visit http://www.wri.org/project/southern-forests. 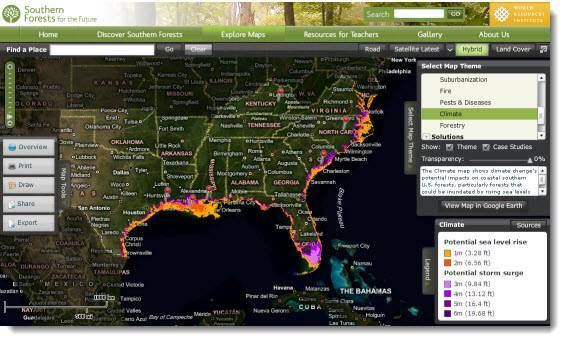 Visit seesouthernforests.org to learn more about this innovative Drupal and ArcGIS Server Flex API application.